Elsinore invites you into the city, where the ramparts of Kronborg Castle, Culture Yard, the bustling activity in the harbor, ships' voyages across the sound, the old well-preserved half-timbered houses and not least a backyard with Denmark's richest cultural heritage, all of which helps to provide a forum wealth of good experiences. Elsinore is a thriving commercial and has been since the 1500s. The historic center has several pedestrian streets with many exciting retail stores, Elsinore City Center, Axeltorv with market stalls Wednesday, Friday and Saturday, as well as cafes and restaurants for a much-needed respite. In the evening there is the opportunity to go to a bar or disco, cinema, the casino or perhaps a concert or theatrical performance at the Culture Yard. From the harbor there are frequent ferry service to Helsingborg in Sweden with the car ferry Scandlines or pedestrian ferry Sound-bus. 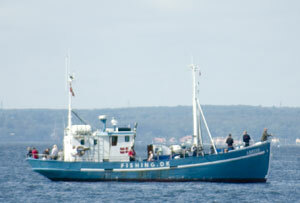 The Sound (Øresund) is one of the best places in Scandinavia for sea fishing. 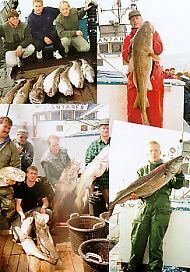 In the summer offers fishing and sea fishing in the Sound from Elsinore, inter alia, garfish, herring and flatfish especially the so-called summer cod in 3 -10 kg. In winter season the herring and the famous department cod chop out there. From Elsinore sailing tour boats at sea fishing, every day, all year. Normally shipped weekdays. 8 to 15, Saturdays and Sundays and some holidays from. 7 to 12 and from pm. 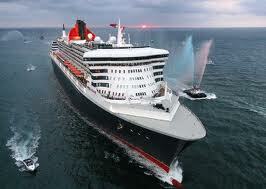 12 to 17 Please contact the tour boats directly for information on sailing times, bookings and prices. Sandmanden welcomes you aboard a very well maintained and clean ship. We sail fishing trips, stag or hen, funerals and what in otherwise you would like. 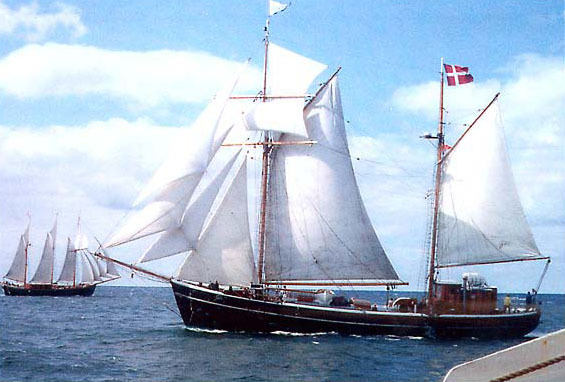 We sail mainly in the Sound and the southern Kattegat. Here is the sovereign good place as we operate only with max 12 pass, the boat actually has room for 24 people, and therefore creates very little line disorder. We have 20 years of experience let it come together for your good. 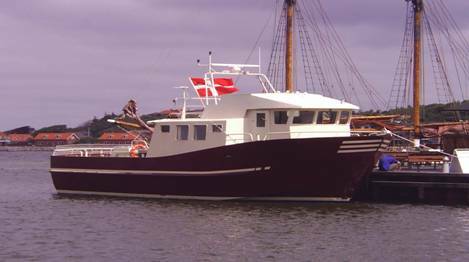 MS SandManden is suitable for family fishing trips and novices. Embark on an exciting fishing trip they will never forget. We have room for any angler. A clean and well-maintained boat perfect for sea fishing as approved by the Maritime Administration to sailing with passengers. We sail with a maximum of 12 people at a time. There is good fishing spot for everyone, so you can freely switch between throwing hand and jigs side along the way. Below deck is heated lounge with tables, benches and bunks for the longer rides. It is also possible to buy food and drink along the way. The crew are even keen fishermen and lend a hand and help less experienced fishermen, if needed. Dinghies for fishing from small boats can be hired at Elsinore. At Elsinore Nordhavn southern pier ramp is available for launching and hauling of own boat. Minimum 2 hours, safety equipment included. Udsætning og ophaling 100 kr. pr. gang eller årskort 800 kr. All aged 18 to 67 who operates fishing / angling in Denmark must have a state fishing license. '*) Can pre-date daily and weekly pass for use on weekends, etc. The fishing license issued by the day, week and season passes, and you can among other things, buy it at post offices, tourist agencies and major tackle shops all over Denmark. You can also buy and renew the license on the website www.fisketegn.dk. The price in 2014 for a fishing license Dkr. 50, - for a weekly pass Dkr. 170, - and for a season pass Dkr. 195, -. Fishing licenses are personal and must be kept in fishing. For the most part fish right in lakes and streams is private, but it is often rented out to local anglers. If you want to fish in such places, you must, in addition to the compulsory license, also buy a special fishing license for the fishing. Fishing permits are typically issued as daily, weekend, weekly and annual passes. You can for example buy your fishing license on the website www.dagkort.dk, where you can also see the current prices and the individual fish watered location. If you are fishing in one of the so-called "put and take lakes," you should not have a fishing license or fishing license. Here you pay typically between Dkr. 70, - and 100, - three hours of fishing. Helle and John Trab welcome you aboard SKJOLD. Skjold has room for 29 people. Children under 10 are not allowed when accompanied by an adult. There can be arranged wreck fishing, competitive fishing, flatfish, trips to Ven, forestry or business trips. Onboard sold blink, jigs, snoods, sweets and drinks. Skjold has a heated cabin with tables and benches are also a toilet on board. Discount for children under 14 and for groups of over 10 people, or charters, except on special trips and everyday trips in January, febuary and March. We can sometimes be hard to get in when we fish around Friend or in the Kattegat. Please try to call us at a later date. Skjold has since 1975 been sailing the Sound and vicinity thin with the same skipper who has sailed with anglers ago in 1969.